...or how Shaun the Sheep helps prevent rickets! Oh be serious! 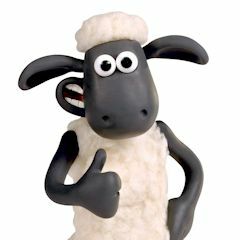 How can Shaun the Sheep prevent anything? Well, actually, is a shorn sheep that can cure rickets, but we’ll come onto that in a minute. 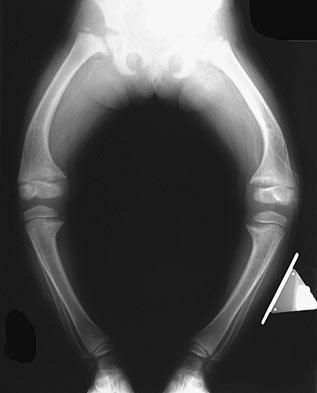 Rickets is a childhood disease characterised by soft weak bones. As the child grows, becomes heavier, and then starts walking, the leg bones bend and bow under the weight, producing a characteristic bow-legged walk. Other bones, such as those in the arms and skull can also be affected, leading to disfigurement and disability. Until about 100 years ago rickets was quite common, even in in the US and Europe. Nowadays it is rare in most developed countries, although it can still occur in poorer countries. Left: A photo of a Victorian child with rickets. Right: An X-ray showing the characteristic bow-legs. Scientists found out the cause of rickets, which turned out to be a deficiency of an essential molecule called vitamin D. Vitamin A had already been discovered in 1914 as a component in cod liver oil, and when a British doctor called Edward Mellanby fed cod liver oil to young dogs, he noticed they did not develop rickets. At first he thought it was the vitamin A that was the active cure, but this was disproven when an American researcher called Elmer McCollum tested modified vitamin-A-free cod liver oil on dogs, and they too were cured. 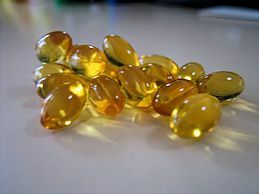 So some other substance in the cod liver oil was the true cure, and this unknown molecule was called vitamin D (as it was the fourth such vital nutrient to be discovered after vitamins A, B and C). 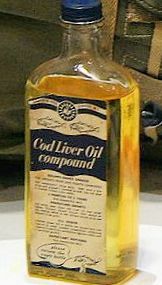 This finding led to teaspoons of cod liver oil being given to children regularly until the 1980s, in an effort to provide them with the vital vitamin D.
Why did people stop taking cod liver oil supplements? Some people still do take it on a regular basis, but it was gradually realised that with a standard healthy western diet (often which contains vitamin D added by food manufacturers), and reasonable exposure to sunlight, a normal person can get all the vitamin D they require without having to eat any supplements. Having said that, there are some recent reports that say supplements might be needed in places where there is poor diet and/or little exposure to sunlight, especially over the long dark winter months. Although some foods contain vitamin D, such as mushrooms, fatty fish, egg yolk, and beef liver, the quantities aren’t that great, and up to 50% of the vitamin D can be destroyed by heating if the food is cooked. In fact, humans get most of their vitamin D by photosynthesis! I thought only plants photosynthesised? Photosynthesis just means synthesising something using light. Plants photosynthesise sugars from water and CO2 using sunlight. But humans photosynthesise vitamin D in their skin, when UV light interacts with 7-dehydrocholesterol which is produced naturally in the liver as a precursor to cholesterol. (compare this the structure of cholesterol). But I thought exposure to UV light caused skin cancer? Yes, too much exposure to the UV in sunlight does cause skin cancer, but in contrast, not enough exposure is also a problem, because sunlight is required to make vitamin D in your skin. Indeed, with the increasing usage of high SPF sun-creams to block out harmful UV, the incidence of rickets in the western world is starting to slowly rise again. There were about 300 cases of rickets reported in the UK in 2014. As well as excessive sun-cream use, the recent rise in rickets has been blamed on children increasingly playing computer games inside rather than playing outdoors, and even on a spate of cloudy summers! So should we stop using sun-creams? But what about hairy animals, such as dogs, that have little exposed skin? How do they make vitamin D? The presence of fur in animals or feathers in birds blocks UV light from reaching the skin. So in these cases, the creatures’ skin secrete oils or waxes which coat and impregnate its fur or feathers. Sunlight then interacts with the oil and produces vitamin D, which is then ingested by the animal or bird when it grooms itself. So this is where Shaun the Sheep comes in? Exactly, in the case of a sheep, the oil that’s secreted is called lanolin, and is the original source of much of the vitamin D found in food additives. 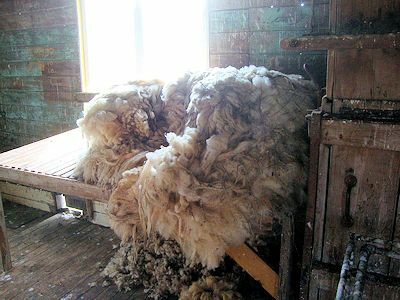 The fleeces from shorn sheep are greasy to the touch, due to the lanolin, and this is washed off, and the lanolin purified and chemically treated to extract the vitamin D. The clean wool then goes on to make clothes, etc. The purified vitamin D, in the form of a white powder, is more expensive weight-for-weight than gold. It is added into various foods, such as bread or breakfast cereals, as a way to ensure we get sufficient vitamin D in our diets, even in the sunless winter months. The fleeces from shorn sheep are full of lanolin. But what actually does vitamin D do? Vitamin D does two main jobs in the body. First, it helps absorb calcium from foodstuff in the intestines, preventing it from being excreted from the body and lost. Calcium is vital for bone growth, so a lack of calcium means that bones do not grow properly or strong enough, leading to rickets or diseases like osteoporitis. Its second job is to help dissolve away unwanted bone. Wait a second, isn’t that defeating the purpose? If there were only a mechanism to grow bone and not to remove it, bone would endlessly grow out of control and become too large. Bone has to be both deposited and then shaped by careful removal of the excess, in the same way a sculptor takes a large block of stone and removes the unnecessary parts. So vitamin D is an important molecule? Well, it’s actually not just one molecule, it’s 5 closely related molecules, called vitamins D1-D5. The two most important of these for humans are D3 (also called cholecalciferol) and D2 (ergocalciferol). Vitamin D1 isn't actually a single molecule, but a mixture of D2 and a closely related precursor molecule called lumisterol. When the term ‘Vitamin D’ is used without any subscripts (as is often the case on food packaging) it refers to either D2, D3 or to a mixture of both also known as calciferol. And in fact, these aren’t even the bioactive forms of the molecule. After being synthesised in the skin (or ingested), vitamins D2 and D3 are carried in the bloodstream to the liver, where enzymes convert them into calcidiol, and then to the kidneys, where different enzymes convert them into calcitriol. Calcitriol is the true bioactive molecule, and can be classed as a hormone, controlling the calcium concentration in the blood, which in turn, controls the growth and remodelling of bones. The three OH groups on the triol allow it to bond to a receptor (Vitamin D Receptor, VDR) molecule, which in turn triggers DNA to synthesise proteins that either make bone from calcium in the blood, or dissolve bone releasing Ca back into the blood. I heard that vitamin D can prevent colds and flu? 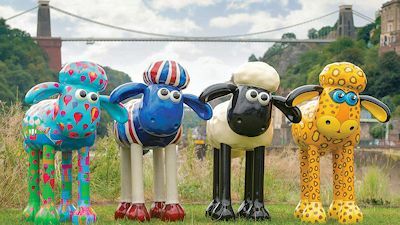 Shaun the Sheep in Bristol, July 2015. Wikipedia: Vitamin D, Vitamin D2, Vitamin D3, Vitamin D2, Vitamin D5, calcitriol. M.F. Holick, N. Engl. J. Med. 357 (2007) 266. D. Gibbs, Royal Soc. Med. 87 (1994) 729. M.T. Weick, Amer. J. Clin. Nutr. 20 (1967) 1234. H.F. Deluca, Bonekey Rep. 3 (2014) 479. L. Tseng L, J.M. Brehm, J.F. Alcorn, F. Holguín, S.J. Aujla, J.C. Celedón, Nutrition Bytes 9 (2003). P.H. Hart, Discovery Medicine 13 (2012) 397. R. Bouillon, S. Van Cromphaut, G. Carmeliet, J. Cell. Biochem. 88 (2003) 332. T.D. Bell, M.B. Demay, S.A. Burnett-Bowie, J. Cell. Biochem. 111 (2010) 7. A.L. Hirsch. "Industrial aspects of vitamin D". In D.J. Feldman, J.W. Pike, J.S. Adams Vitamin D. (London; Waltham, MA: Academic Press, 2011). A.R Martineau, et al., Vitamin D supplementation to prevent acute respiratory tract infections: systematic review and meta-analysis of individual participant data, Brit. Med. J. 356 i6583.